While it’s difficult at times to maintain their cool, our fans prove that calmly discussing the facts and having incredible pit bulls to change perceptions really goes a long way. Thanks everyone for sharing. My own emotion. My feelings get hurt and then I get defensive and angry when I encounter someone who is adamant that “these dogs are ALL bad.” Not too long ago, a customer at the kennel I work at actually made me cry because he was pointing to my dog specifically and telling me that I was putting my life in danger and that my dog was no exception… he was just as willing to kill me as all pits are and one day he’ll maul me in my sleep (literally, the guy yelled these things at me). I should have laughed at the absurditiy, but my boy is my baby and instead it made me sad…. so I cried. When someone quotes an “authority” like an animal control officer or a vet that pit bulls are inherently vicious. The news media. Whenever a bull dog, boxer, or some unknown breed attacks or bites someone… it’s always a pit bull. I don’t have much problem other than the idiots that are so brainwashed by the media’s hype they can’t see how well my APBT service animal is behaving. Those individuals who refuse to have an open mind about this bully breed yet they’ve never interacted with one bully breed. The hardest part in my advocacy quest has been the “experts” out there who say that pits are different than “normal” dogs (my pit *IS* a normal dog). They don’t need a heavier hand or any more specialized training than any other dog. I’ve heard from clients that their vets told them to “be careful around pit bulls, you can’t really trust them” or another trainer telling them that they need to use heavy punishment methods because of the breed. I was at the ER and someone had gotten bit. It was a teenager walking a German Shepard and another teenager walking the bully the dogs got into it and the kid got a puncture wound trying to break them up. The ER doctor said “you are lucky the pit let go, you know they have locking jaws that won’t let go until they do a lot of damage, they are trained to kill” Of course while sitting there listening to this I pulled up the facts on my phone and politely interrupted the doctor and educated him and the patient. 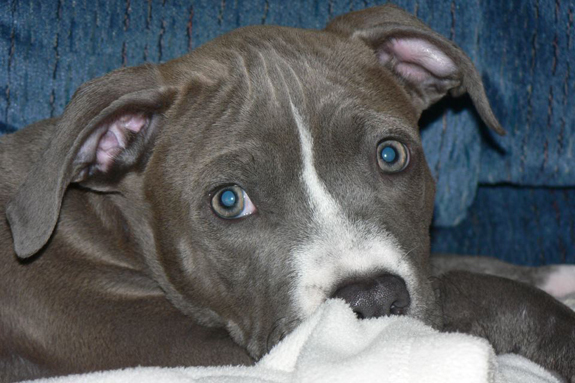 People have a general fear of bully breeds because of the media. This is my biggest problem. I have people turn and walk the other way when they see my happy smiling tail-wagging AmStaff mix walking in their direction. Then there are other people who walk right up to her and let her lick their face clean. I have struggled to overcome and manage the massive amount of misinformation that is available. It has taken me a long time to accept that I can’t always change what people think or how they feel about pit bulls. 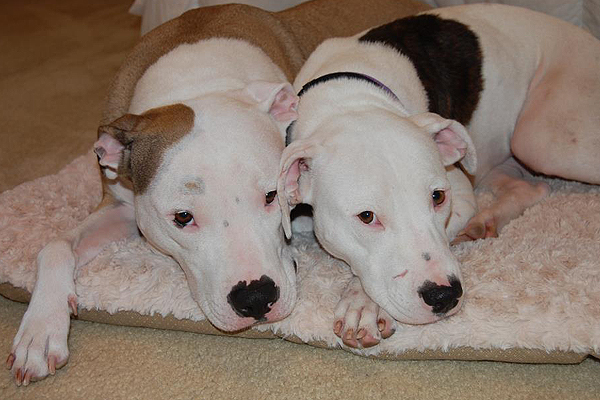 As a passionate advocate and proud mom of two pit bulls, I have shed many tears over the ignorance of others. I find it frustrating when people who have never ever met a pit bull slander the breed. I have a relative who is one of them, they claim to hates all pit bulls, they won’t even pet my dog simply because she is a pit. They took everything from the media and put a black mark on my dog. Funny fact though, they have a German Shepard mix who has got to be the worst behaved dog I have ever met. He weighs roughly 90-100lbs, jumps on people, nips at faces, knocks over children, won’t come when called and starts fights with other dogs. I made the mistake of taking my pit to their house once, her dog jumped, slapped and bit my pit, who in return gave him a grumbly “knock it off” growl, and rightfully so. They pitched a HISSY claiming that my dog was going to hurt their dog, then proceeded to yell at my dog and shoo her away, all the while their dog was alternating biting her and nipping at me. Needless to say we don’t visit anymore, apparently my “dangerous dog” is to much for their precious baby. My dangerous pit, who plays with a 30-lb. Boston Terrier without issue, my dangerous pit who mothered a box of kittens I brought home once, cleaned them all and let them sleep on her. Long story short, I am frustrated by people who can’t bother to look up the facts before making an assumption and then when I try to explain to them the tune me out. I try not to get over emotional, but when you bash my dog for no reason other than her breed, it irks me. It’s mostly the media hype. But nothing hurt me more than when I was walking with my dog through a street fair and PETA had a booth. My dog had gotten in trouble with AC by getting out, so I had to muzzle her. She didn’t hurt anyone, but them’s the rules. The folks manning the PETA booth told me she would be better off “put down” than in my family home because, “she wasn’t happy in captivity”… they met my dog for 5 minutes, she was wagging and smiling (albeit behind a muzzle). I know this is not just a bully issue, but it was enough that we had to muzzle her at an event she was essentially welcomed at for several years previous … it was at that moment that I turned off anything PETA has to say EVER. If anyone looks at Lacy in ANY picture or meets her, she is clearly happy and a normal, loved, domestic animal. 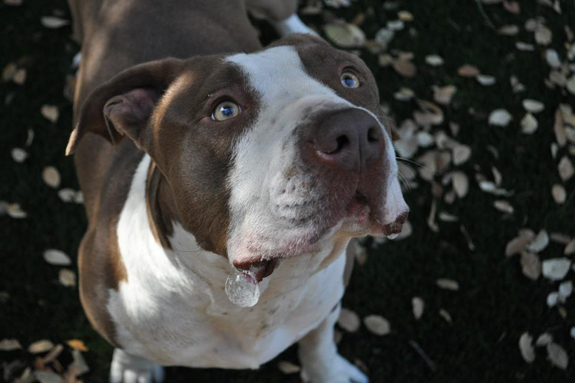 The name, “pit bull.” ANY other name would be better. When Rotties and Dobies were the IT dogs, there wasn’t the terror associated with them, like pit bulls. Just name dooms many dogs, even the puppies and seniors that haven’t hurt anyone. Trying to be heard and taken seriously by legislators after others contacting them to repeal BSL had threatened, referred to violence, or made racist comments. This has caused a stigma for advocates and has caused legislators to cut off discussion with all pit bull advocates, and scared the public away from addressing the subject. My biggest issue is the fact that people are so judgmental and do not understand pit bulls. Her being part pointer does not help because she loves to attempt to catch birds and rodents. People then automatically assume that she will treat a human the same way. My response is usually to laugh it off because I know that if my dog thinks she hurts someone she is belly crawling and apologetically licking them. I have two challenges. One, I am an owner of an APBT with her CGC. Two, I am also a journalist. Turning around falsehoods in one’s community is one thing, but working to change how my industry does things is quite another. We journalists have a long road to redeem ourselves when it comes to publishing for quality as opposed to ratings. There’s NPO’s and NGO’s doing good work out there, but the pit bull topic is still a touchy subject and few organizations will fund full documentaries to turn public view around. So, yes, it is hurtful when someone comes to me and tells me they can’t wait for my dog to turn on me and kill me (yes, this was said to me), but it is also hard knowing you possess the skills to get proper media out there when few groups (if any) will fund it. I had a debate with two friends a while back about pit bull type dogs and BSL. Neither of them would open their minds to the fact that pit bull type dogs should be treated equally with other types of dogs. 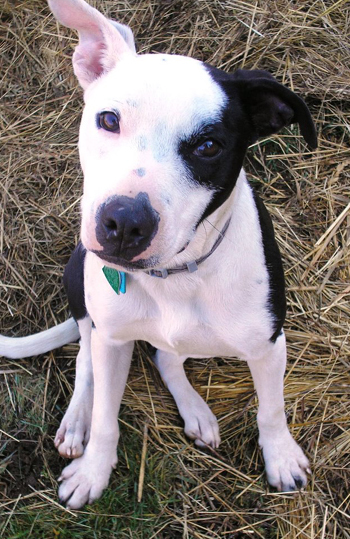 Because of the pervasive myths and misinformation about pit bull type dogs, they were convinced that pits are somehow different. Somehow more dangerous. Until someone is willing to open their mind and accept that those myths are not only wrong but dangerous to both dog and human, then they cannot be reached. I am still finding that even the friends I have or even those that know my dog well are still waiting for him to attack or act aggressive. The stigma that they are aggressive is still there. In fact just this last weekend at a show another dog lunged at him and he didn’t react at all and everyone praised him for it. My thought was “was he suppose to react?” Because of his breed they expected him to attack. We have taken our youngest pibble (2 years?) out to the local Friday-night car show, and asked people to feed her her entire dinner by stranger-fingers! She ate her entire meal on the kindness of strangers, which helps to socialize her. The largest (amusing) roadblock we found, was that AFTER feeding her and petting her and loving on her and admiring her manners — when people learned that she was a monstrous media-fibbed Pit Bull, that they were shocked and horrified… on the flip-side, MOST of them were amused that they had just hand-fed a pibble. Opening THEIR eyes and teaching her that Any-Stranger-May-Have-Treats was our objective. Success on both accounts. When we got our first pit bull, in the beginning I was offended when people crossed the street or lept off the trail into the bushes to avoid us. Now I just think, Oh good! More room for us! 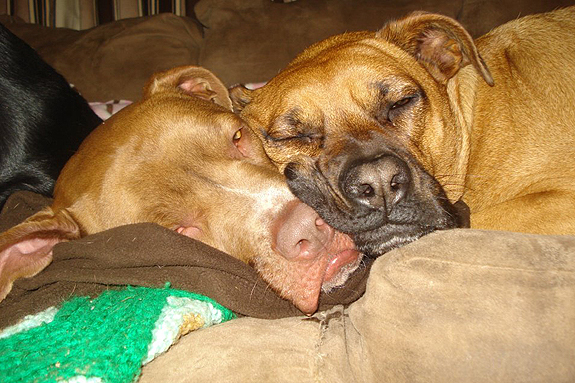 How anyone can label these angels “dangerous,” “vicious,” and other ugly things is beyond me! All they need do is look into the eyes of a Pit Bull and they’ll see so much love and acceptance, it will take them by surprise! Our Pibbles are not “maneaters” or “child killers,” they’re like ANY OTHER DOG! Unfortunatly, our very own daughter and son refuse to bring our grandchildren to our home because we now have a Chocolate Lab/Pit Bull mix, who will serve as my service dog after training! 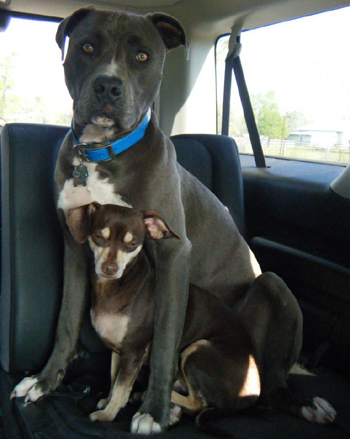 I feel my husband & I are being punished because I chose a Pit Bull mix to be my service dog. And the weird thing is, all 3 of our children GREW UP with a Chow Chow/Pit Bull mix!! They won’t even give Nalani a chance to get to know them! They’ve convinced themselves that she’s just waiting to attack them or their children! As if I would purposely put ANY of my family at risk by owning ANY KIND of vicious dog!!! Come on now!! Nalani is as vicious as my cats are!! GIVE HER A CHANCE!!! @StellaGVidales We are so sorry that your children believe the myths about pit bull type dogs, not only are you losing out on seeing your grandchildren, but they are losing out on knowing an incredible dog. You have our support and the support of the entire Stubbydog community. Please let us know after Nalani goes through training and feel free to share your story with us. Just email [email protected]. 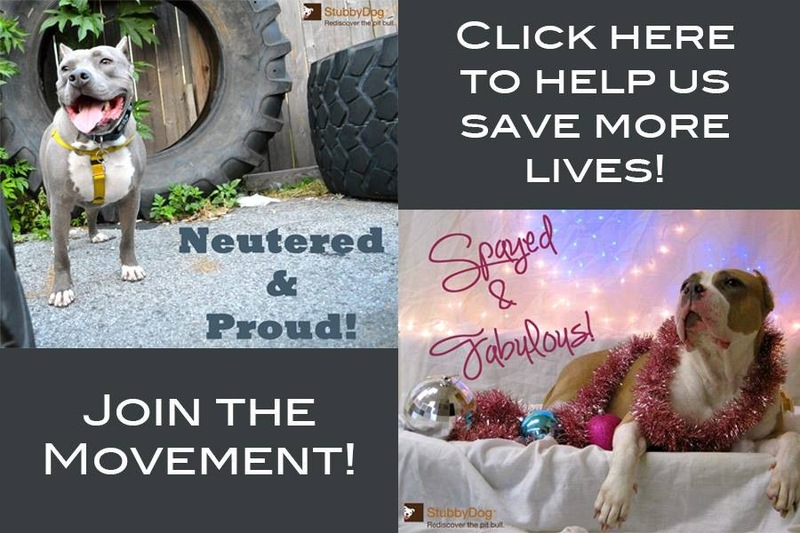 @TashinaWenzoski thanks for sharing, we always say that all it takes is just one incredible pit bull to change perceptions. Good job Meena! until my beloved cat passed away from old age. I had just came home from the vet, and went to my room and cried, Taz came in, put her head in my lap and stared at me with her big brown eyes as if she were telling me “Don’t be sad, it’ll be okay” And that’s when I became a dog person. She comforted me in one of my darkest moments, even though I’d never before given her the time of day. That’s pure unconditional doggy love. I soon got my own dog, a Siberian Husky named Caleigh. Her and Taz are great friends. @DogMom1990 We are so happy Taz comforted you when you needed it and we are happy that you received her love and it changed you. Best of luck in your move and adopting a new pit bull. However I am moving out of state soon and my dad won’t let me take his dog, so in all fairness to Caleigh, I will be adopting my own Pit Bull and maybe a new cat as well. Siberian Huskies and Pit Bulls go together.